FM radio has awesome features – it’s free, it doesn’t use up your data, it often has better reception than LTE, it offers various mixes of playlists (both hip and classic) along with news and up-to-date info. So, why does it seem like makers are increasingly reluctant to include it in their phones? Well, while the FM receiver has certainly declined in popularity, there is still a variety of models to choose from. We put together this chart that counts the different number of models by multiple makers that have a receiver. The peak was in the 2008-2010 period. The chart gets a little busy on the right (click on it to view a larger image), but the main takeaway is this – there is still variety for those who want to listen to terrestrial broadcasts. You may have spotted Apple there on the bottom. 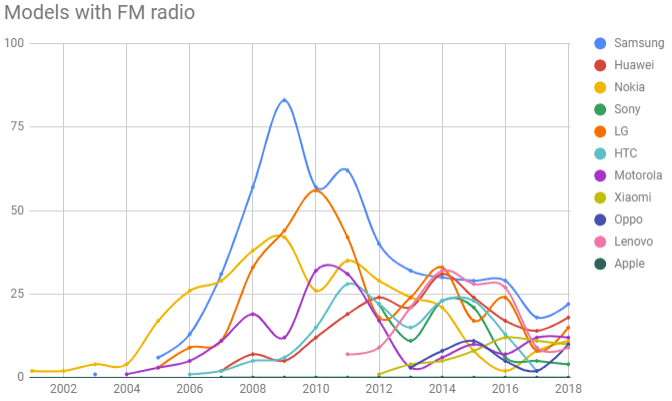 The iPhone maker never included an FM receiver on its phones (though some iPods had one), we only included Apple in this chart to point the finger at them. It’s important to note that the chart shows the number of models that makers produced, not sales – that part is up to you as a consumer. So, why is FM radio declining? It would be easy to lay the blame at Apple’s feet, after all the radio requires wired headphones (which it uses as an antenna). By the way, USB-C headphones work too, it doesn’t have to be through a 3.5mm jack. But there are other factors to consider – the rise of music streaming combined with cheaper data plans, for one. Sometimes, the receiver is present but lacks software support – that was the case with the Galaxy S9/S9+ in the US and Canada (it was enabled via an update). There was a similar situation with the S8/S8+. Samsung’s Galaxy S line tends to be the exception, however, most phones with €400+ price tags do not support FM radio. Not even the Galaxy Note phones, strangely enough. LG, vivo, Asus and a few others do pack a receiver into their high-end offerings, but not in all of them. That’s odd – when did not having an FM receiver become an elitist feature? Sooner or later FM radio broadcasts will cease. Norway already stopped national FM radio stations (local stations do still exist, though). 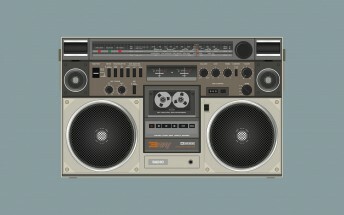 The successor to analog radio is here already - DAB and HD Radio. These can pack more stations in the same bandwidth, offering more variety, and more recent iterations offer improved quality. Streams up to 320Kbps AAC+ have been demoed, though 128Kbps and lower is much more common. Unfortunately, there’s no wide support for these digital standards. 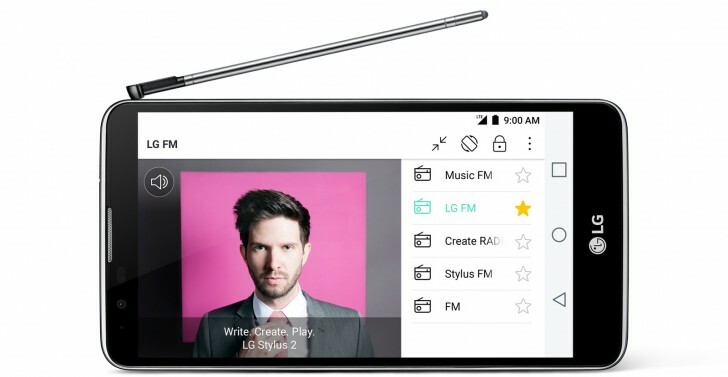 The LG Stylus 2 (from early 2016) is the only phone we could dig up to have a DAB+ receiver. Would you like to see more models adopt digital radio? Do you use digital radio at home or in the car?